You protected and opened this magical forest! Thanks to donations from generous Save the Redwoods League members like you, a magical forest of big redwoods is ready for you to walk its wide, welcoming trails. 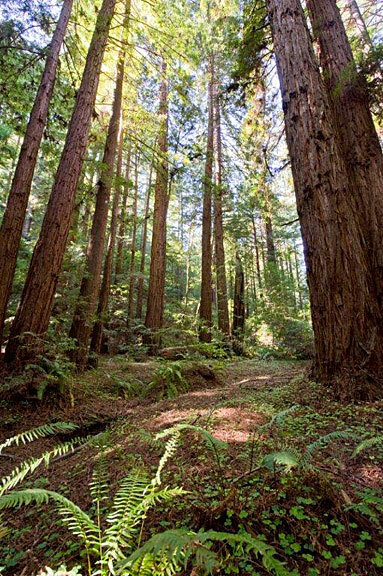 Now part of San Mateo County’s Memorial Park (external link) and less than an hour from Silicon Valley’s millions of people, the Loma Mar Redwoods forest in the Santa Cruz Mountains is a delight. You can see three conjoined redwoods comprising a huge trunk that stretches 13 feet — wider than two adults’ arm spans. Many other redwoods here are wider than your arm span. The size of these trees is unexpected considering this place was almost clear-cut in 1900, and logging companies worked here as recently as the 1980s. Today, this 174-acre forest is extraordinary. Just a five-minute walk from Pescadero Creek Road, this wonderland absorbs sound, embracing you with its stillness. Redwood sorrel plants as big as your palm carpet the floor. The trill of winter wrens and the minty air add to the dreaminess. Dudfield Creek runs down a staircase of tree roots through deep, wild canyons to the Pacific. Safeguarding this tributary to Pescadero Creek helps protect endangered coho salmon and threatened steelhead that run in the area’s waterways. Loma Mar Redwoods is important also because it buffers the habitat of endangered marbled murrelets in Memorial Park. Your donations contributed to our $625,000 commitment for this project, sharing costs with Peninsula Open Space Trust, the Gordon and Betty Moore Foundation and the California State Coastal Conservancy to buy the property for addition to Memorial Park. The main part of the park is a popular place to picnic, camp, wade and hike in the old-growth redwood forest. Proceeds from the sale support outdoor education programs of the willing seller, the San Mateo County Office of Education. About a mile west of the Memorial Park entrance (external link) on the north side of Pescadero Creek Road, look for the Loma Mar sign and a parking lot for four to eight vehicles. Parking is free of charge. Neither trail markers nor maps are available yet. An unofficial trail gradually gains about 500 feet in elevation through the forest to the north and west for just under a mile. Restrooms are available near the entrance of the main part of the park at 9500 Pescadero Creek Road. With a healthy reserve, we can respond to opportunities with tight deadlines as we did with Loma Mar. Please donate today to help us react quickly when the redwoods need us. You can be part of our vision to ultimately protect 30,000 acres of redwood forests in the Santa Cruz Mountains and safeguard clean air and water, habitat for imperiled plants and animals and public access to recreation.